Inflatable tents (or air tents) are the most recent innovation in the world of tents. 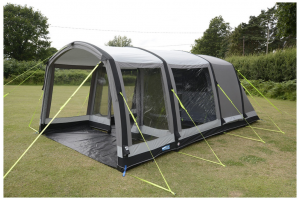 The biggest advantage of inflatable tents are that they're quick and easy to pitch. On average, it only takes about 10 minutes to pitch an inflatable tent. This is extremely convenient when you're planning to move around from camping to camping during your vacation, but all the same just in general. 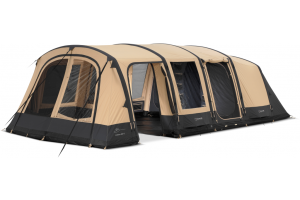 Inflatable tents come in a range of sizes, from family tents to small tents, but also backpacking tents. Inflatable tents are so quick and easy to pitch, because they operate on low air pressure. This means you could use a regular air bed pump to inflate the tent, but rest assured, all inflatable tents come with an air pump to match. At the moment there are two inflate systems on the market, one where you inflate all air beams separately and one where all air beams are interconnected, meaning you can inflate all beams simultaneously. Just like regular tents that use poles, inflatable tents come with different types of canvas used, ranging from polyester to cotton. 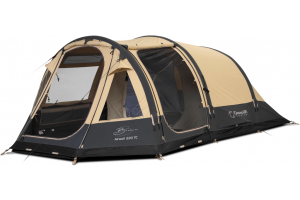 At the moment, we offer various inflatable tents from top brands like Bardani, Kampa, Outwell and Eureka.